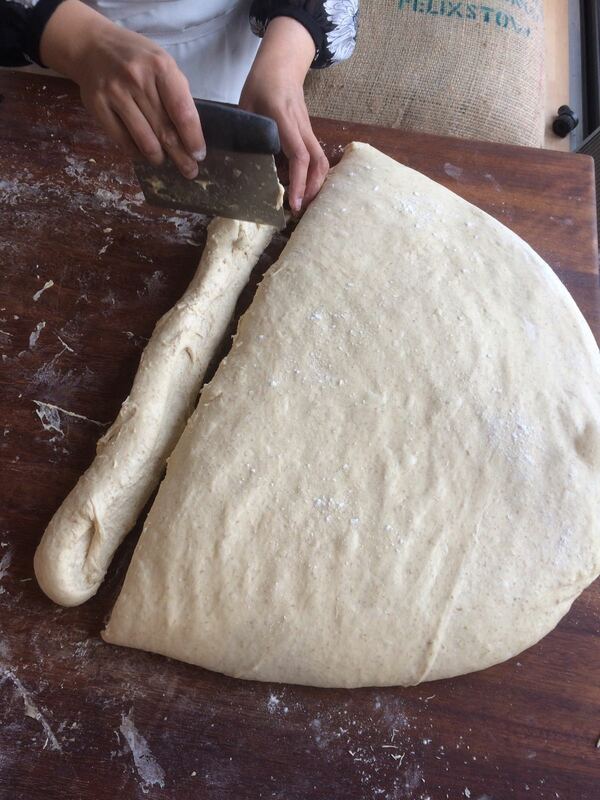 Flour and water flatbreads baked on a fire-heated stone are beginning to pile up in teetering towers as baker Jean lifts each dough pocket from the flames, waiting for the moment the steam fills each bread with air, puffing up the pitta like a blowfish. Joana is here early turning over the dough for the next batch of bread. Elsa arrives to set up a weighing and shaping station. 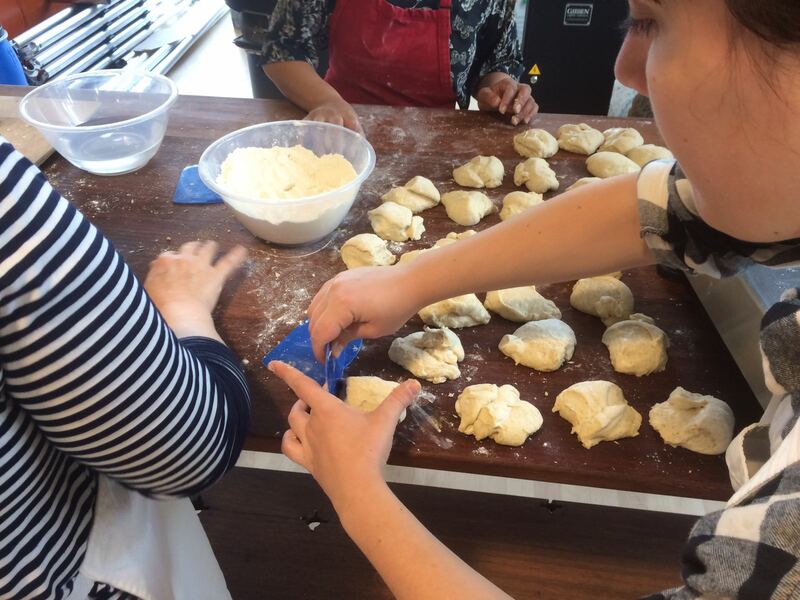 We look over the flatbread recipe: “is that it?” For six thousand years in the history of flatbread, it’s never been more than this – just a measure of flour and water, cooked over the fire, conjuring smells of home. 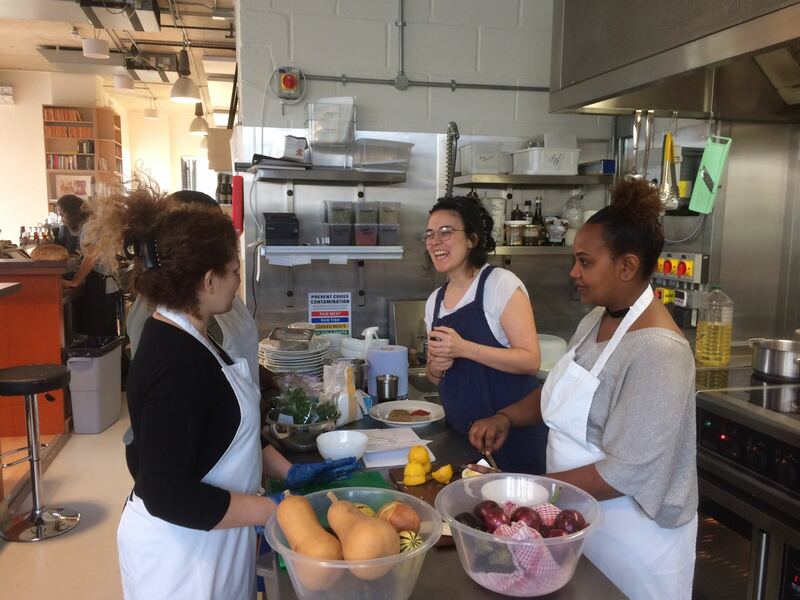 Today half the group are preparing lunch in a tutorial with head chef Irem who is the founder of Topik, a series of supper clubs and food events that showcase the dishes of minority groups in Turkey. 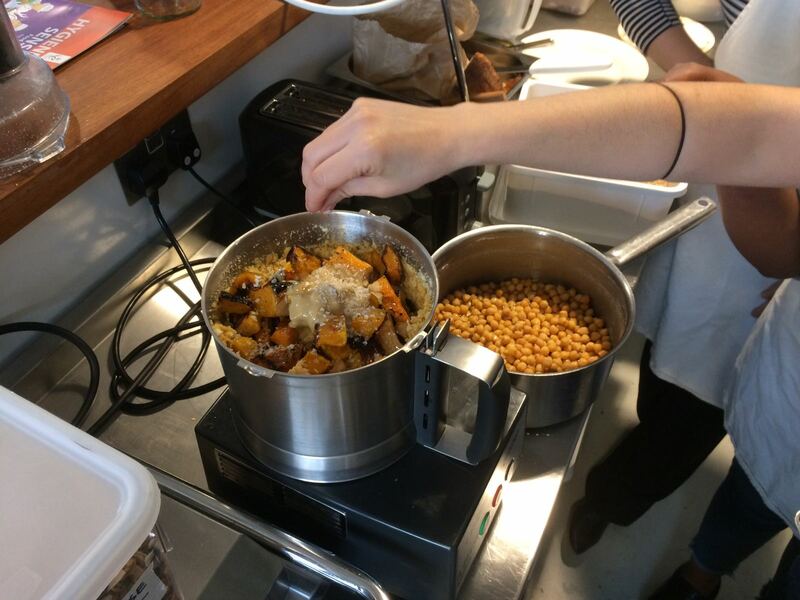 The menu changes daily here, and while bread forms the heart of every dish, it’s only part of the café’s enterprise. We’re getting to know all the mechanisms of the kitchen and the bakery, which work in synergy here. Anwuli writes out today’s menu. Hummus creamed with roasted squash, saffron orange and black round the edges, sesame rolled chick pea falafel, aubergine imam bayaldi. But it’s the tzatsiki which gets us talking. 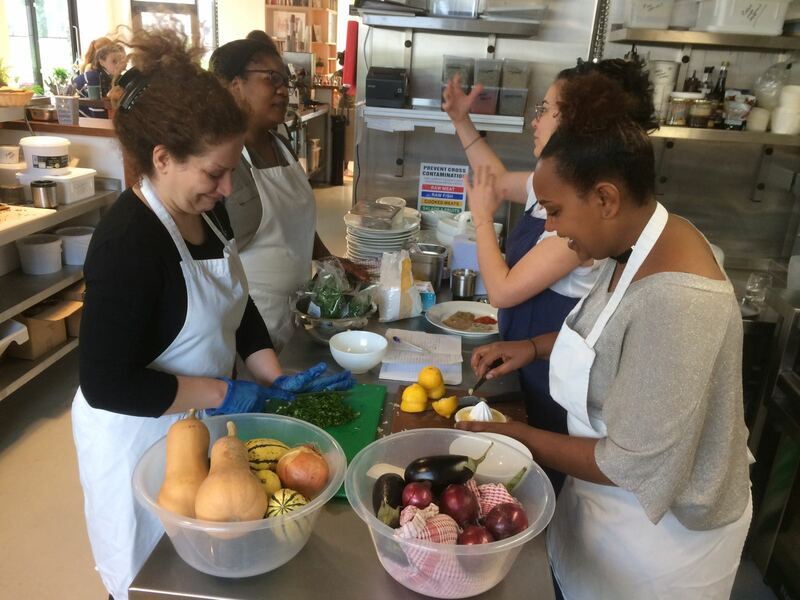 Fatimah and Razieh discuss their own variations of the dish in Farsi. Zahida tells me she uses parsley, not mint. 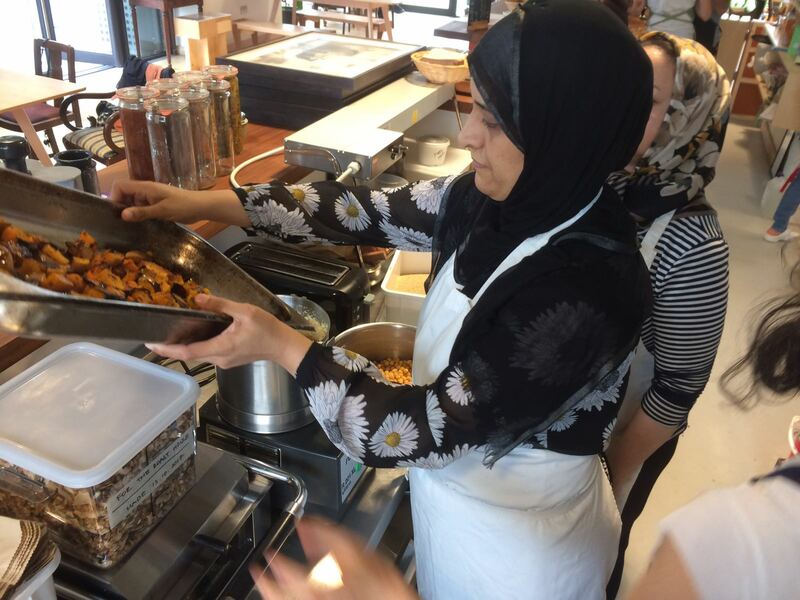 Irem laughs and shows us her own recipe for za’atar, holding up a tub for us to smell – it’s a key ingredient for many of the dishes served here. 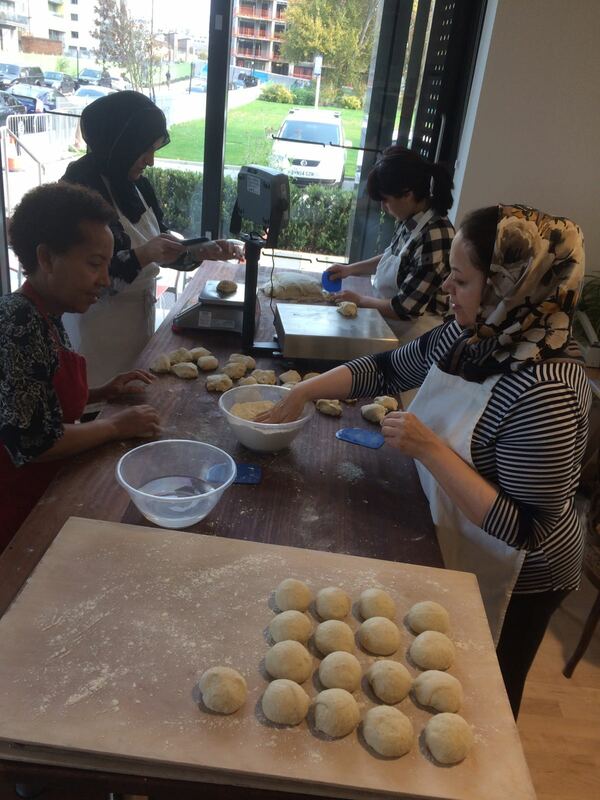 Elsa shows the others how to shape the flatbread on the surface top, but Zahida’s secret technique is to use her floured hands to roll each dough ball into a seamless sphere. Perfect, Jean says, keep doing what you’re doing. 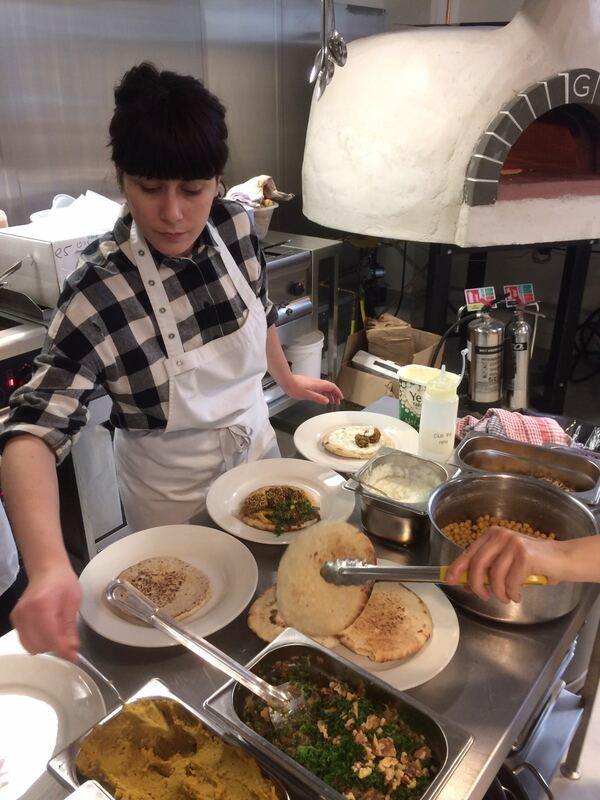 Flatbread crowned with a dollop of each mezze dish are carried out to diners by Joana and Jordanos as the orders roll in. We take turns to break from baking and eat what we’ve made, plating the flatbreads for each other, each taste more or less like what we’re used to eating at home – hotter, dried not fresh mint, more butter, while steam continue to rise up from the oven flames, and the scents of smoky flatbread linger.